This weekend I watched 3 movies. Two of them, "A Streetcar Named Desire," the classic by Tennessee Williams, and "Shopgirl," by famous comedian Steve Martin, happened to be on television, and I was in the mood. The third, Woody Allen's latest effort, (emphasis on effort), "Whatever Works," was playing at the local movie theatre, and had been on my list to catch this summer. Being a firm believer in fate, and that there are no "happy accidents," it struck me today that all three movies had a common central theme, that I might never have realized had I not seen them within a few days of each other. These movies, in addition to many of our greatest novels, plays, paintings, and dances, focused on the fact that it is an integral part of the human condition that we are disconnected from one another, whether due to family circumstances, events and incidences in our lives, societal conditions, etc. 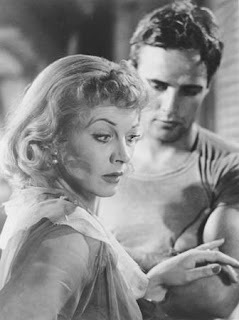 Blanche Dubois was permanently scarred by the unfortunate "incident" and the shooting of her "young boy" when she was 16, and is destined to spend the rest of her life desperate to connect with others, and her failures lead to her own insanity. Mirabelle, in "Shopgirl," moves from Vermont to LA, and drifts as a bored shopgirl in the glove department at Saks Fifth Avenue, yearning to love and be loved and to have a creative and rich life. In "Whatever Works," Boris Yelnikov is a misanthropic social misfit who complains about the world and all its conventions, whose relationship with Melody (Evan Rachel Wood), ultimately brings him around to a more upbeat way of living, and his philosophy of life becomes: it is so short, we might as well enjoy ourselves--ie. connect with someone. "I rely on the kindness of strangers," would have referenced her Twitter, Linked In, and Facebook friends. What do your social networks mean to you? Are you a, b, c, or all or none of the above?